During the next week, a wayward U.S. spy satellite will makepasses across North America and western Europe soon after sunset and should beeasily visible to the unaided eye. That's if it doesn't get shot down first. The falling satelliteis named USA 193. It was launched Dec. 14, 2006. It has been described as beingsimilar in size to a school bus and might weigh as much as 10,000 pounds. 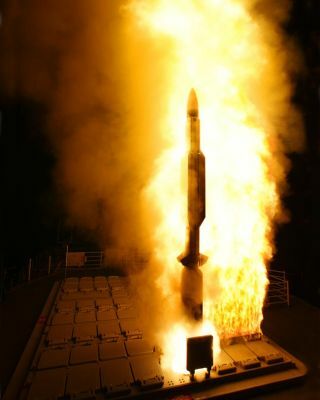 Itcarries a sophisticated and secret imaging sensor but the satellite's centralcomputer failed shortly after launch, never reaching its final orbit, and thePentagon declared it a total loss in early 2007. Since then, the satellite's orbit has been decaying — slowlyat first. But in recent weeks USA 193's nearly circular orbit has been rapidlylowering. Currently, its altitude is approximately 160 miles (260 km) above theEarth. Unless a proposed plan by the Pentagon is enacted to shoot down USA193 during the next week, the satellite could conceivably re-enter theEarth's atmosphere and burn up sometime in mid-March. Today through Feb. 22, USA 193 will make a number of eveningpasses over North America and western Europe. It's orbit is inclined58.5-degrees to the equator, a setup that makes it readily observable from mostof the Northern Hemisphere. During this period, USA 193 will move along a generalsouthwest-to-northeast trajectory and pass over a number of cities in the United States, southern Canada and western Europe. To spot a specific satellite, you need to know when andwhere to look. Predictions for the times and locations of USA 193 are available at the Heavens Above website (www.heavens-above.com).Based on this website's sighting information, USA 193 will be very favorablyplaced for observation over a number of large cities, assuming it is still inorbit around the Earth and weather conditions permit. From Chicago, as an example, the spy satellite is predictedto reach as high as 38-degrees above the horizon (nearly four fists) on Feb.17. That same date, as seen from Orlando, Florida, an evening pass as high as65-degrees is predicted. From Boston and Seattle, nearly overhead passes are forecastfor (respectively) Feb.18 and Feb. 22. And on the latter date, London, England should have a fine pass, with USA 193 arcing as high as 77-degrees above the horizon. It should be stressed that because of the rapidly changingnature of its orbit, sighting information from Heavens-Above should be checkedfrequently. Those whohave seen the International Space Station(ISS) flying across their local skies should be aware that USA 193 will appear noticeably fainter, since it's quite a bit smaller than the ISS. Yet,at its brightest, the spy satellite still should rank as bright as thebrightest stars, at roughly first magnitude in astronomers parlance. Also, sincethe spy satellite is in a lower orbit than the ISS, expect USA 193 to move much more rapidly across your line of sight.